Today is International Nurses' Day, the annual celebration of nurses around the world and their vital contributions to society. 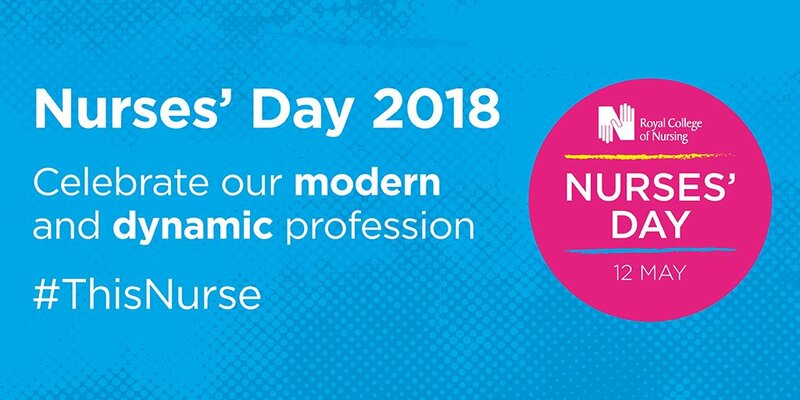 To celebrate the day, the Royal College of Nursing (RCN) is showcasing nursing as a modern and dynamic profession. Nurses’ Day is held every year on Florence Nightingale’s birthday (12 May). It gives health care staff, patients and the public the chance to reflect on the valuable contribution nurses make to people’s lives. This year, the RCN is promoting surprising things that nursing staff do and celebrating the highly-skilled nursing profession in 2018. They are leaders within health care organisations but also volunteer to help local communities and provide health care for people overseas. The RCN is encouraging nursing staff to use the hashtag #ThisNurse to share stories of colleagues who went the extra mile to provide patient care and times which reminded them why they are nursing in 2018. 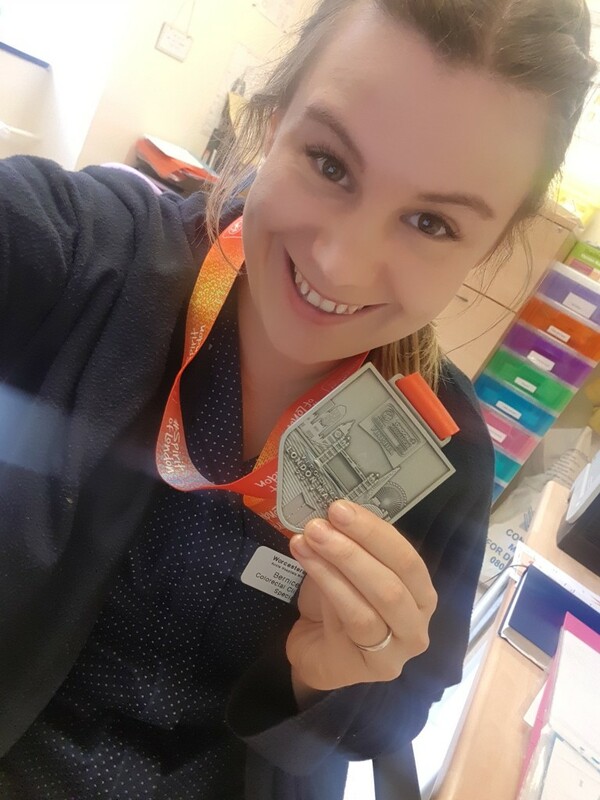 With that in mind, we asked our 2017 Gary Logue Colorectal Nurse Awards winner and London Marathon 2018 finisher Bernice Kent what being a nurse means to her. What’s your best memory from being a nurse? "This is a massive question as there has been so many. I have been a qualified nurse over 10 years now and I have to say most days I learn something new and have a new experience. There is so much to learn and, as nurses, we are developing all the time. "I will never forget my first day as a qualified nurse on a colorectal surgical ward and having my first group of patients assigned to me. I know I looked like a deer in headlights; I couldn't believe I had got there after 3 years of training. That day, and that time in general, was a lesson a minute and very busy. I had to learn very quickly how to prioritise my work and manage my time efficiently. "Then 3 years ago I was offered my job as a Colorectal Clinical Nurse specialist, a job that at the time I thought I would enjoy. I was so excited to start and learnt very quickly that it was definitely the direction my nursing career needed to go. With this role I found a new found love for my nursing career. I have had many experiences, from going to theatre to watch surgery to preparing patients for surgery, recovering them from surgery, being there when patients have had both good and bad news, and getting to know people through one of the hardest times of their lives. "Although I cannot change their diagnosis, if I can support them and make some things easier (whether it’s giving them a person to speak to about things or simply signposting places that can help their individual needs) I feel rewarded." What did winning the Gary Logue Colorectal Nurse Award mean to you? "It means so much to me that I don't know how to put it into words. To be recognised for the hard work and long hours I put in to my job is incredible. In my opinion, it is a reflection of the amazing team I am very proud to be a part of. It has had such a positive impact on our unit and the work we do to develop the service we give to the patients with colorectal cancer in Worcestershire." What inspired you to become a colorectal clinical nurse specialist? "Although I loved working on the surgical wards and learnt so much from it, I had got to a point where we all do in our careers where I wanted to progress and take on a new challenge. It felt too good to be true when the opportunity came up in a trust I really liked. I loved the idea of being patients’ key worker and port of call during their cancer pathway, as continuation of care is very important to me. "I was always passionate about looking after patients on the ward and hearing their stories; it made me want to know more about cancer and its treatment. This job allows me to look at the whole cancer pathway, including raising awareness, suspicion of cancer, investigations, diagnosis, treatment and living after cancer support (to name a few)." What inspired you to run the London Marathon, and why did you choose Beating Bowel Cancer to fundraise for? "I started running 4 years ago after having my little boy to get healthy and lose weight. I joined a local running club and built up the distance from 5k to 10k and then signed up for the Silverstone half marathon with Beating Bowel Cancer march 2017 which was an incredible experience. The running for me became my half an hour after a busy day to process things as well as teaching me that hard work really does pay off, and of course it leaves me feeling so much healthier. I then decided that I wanted to run a marathon, and wanting it to be the London Marathon I knew if I had a chance I would have to apply for a charity place. With all the exposure to bowel cancer looking after my patients and the support we have had from Beating Bowel Cancer, I could not picture myself being more passionate about raising money for another charity. "Our unit gives out the patient information that the charity have made as they are so well put together and easy to read for patients. We were also so lucky to host a patient day at Worcester Royal Hospital which was an amazing day for patients and their families living with and beyond bowel cancer. To be able to help towards these events after having such positive feedback from my patients was yet another reason to fundraise for them. "The charity also supports Colorectal CNS nationally with an annual forum, which is a good opportunity for us to network, learn about the latest practice and treatment updates, and know how each service is developing. It has been an incredibly inspirational day both times I have been lucky enough to go. 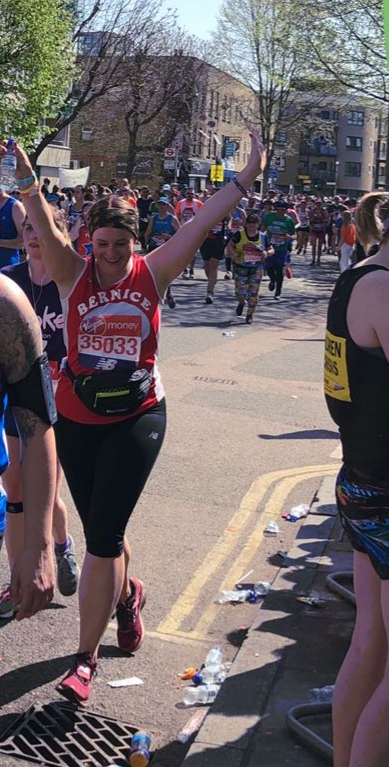 "Helen and the rest of the team at Beating Bowel Cancer were so supportive throughout the whole marathon journey and it was so nice to see them there on the day! (I hope they consider me for a place next year as I really would love to do it all over again!" What’s your message of hope to those affected by bowel cancer? 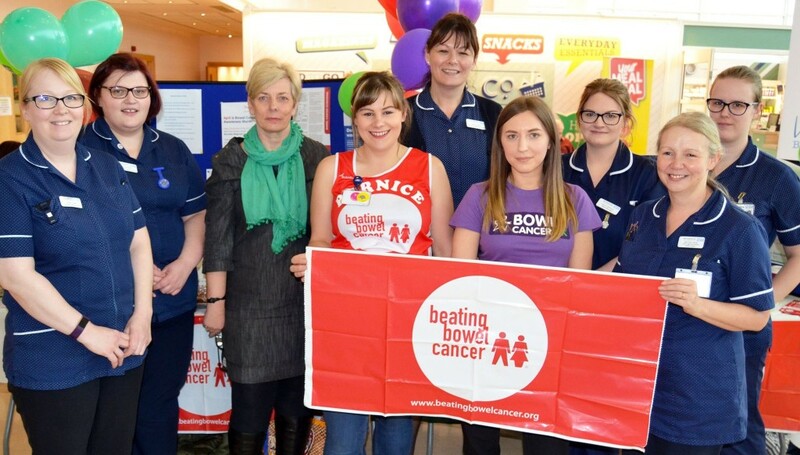 "It is such an exciting time with both Beating Bowel Cancer and Bowel Cancer UK joining forces this year because of the combined hope to stop bowel cancer and continue to support those affected as well as raising awareness of the disease and investing in research. We know that early diagnosis ensures a better outcome and with this, bowel cancer is very treatable. In the 3 years in post I have also seen significant changes and developments in treatments bringing a more positive prognosis to many. I can only see this improving over time with more and more research and trials. "Also use your CNS (Keyworker) we are here to help and support you through a tough time. Go to the support groups and patient days! You are not alone and there is so much support and advice out there."